WCC offers these program areas tailored for UA members. Click on a link to view program requirements. This program area is for UA members interested in moving into a construction management position. Classes in this area concentrate on supervision and project management skills, including human resources management, contracts, and other legal issues. For more information visit the Construction Supervision page. This program area is for UA members who want to pursue college credit in areas that augment or complement current trade-related expertise. Elective classes allow students the flexibility to customize the degree to meet their own occupational needs. This program area is for select UA instructors participating in the Instructor Training Program held each August at the main WCC campus in Ann Arbor, Michigan. 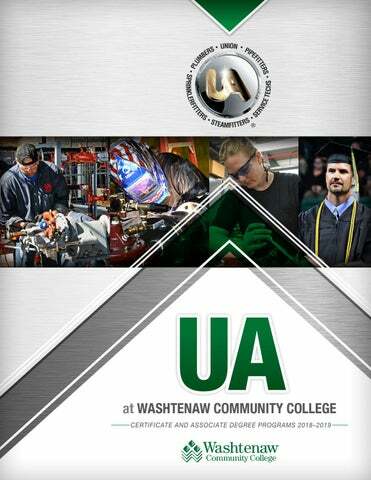 The program offers professional and technical classes related to trade teaching in the United Association. If you have a problem with an online class at WCC, review your Student Rights and Responsibilities described in the Board of Trustees Policy 4095.